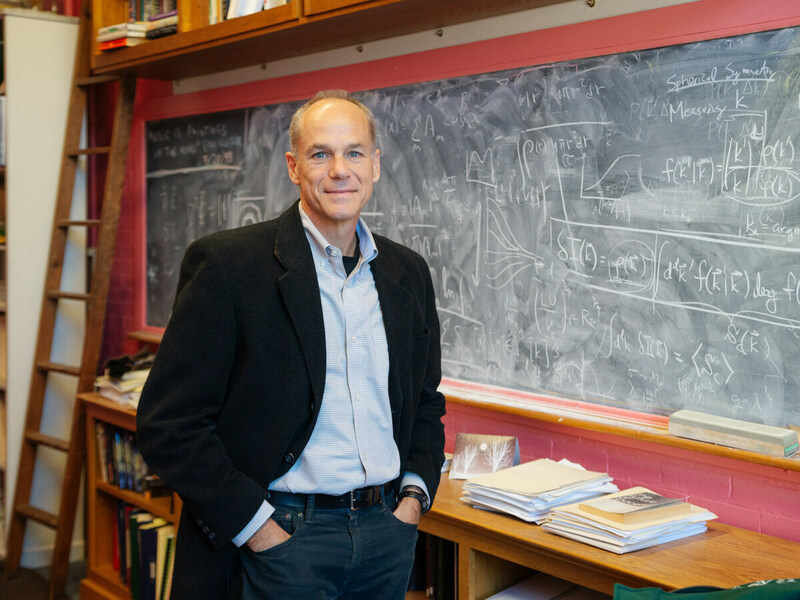 Templeton Prize Awarded To Marcelo Gleiser, Who Tackles 'Mystery Of Who We Are The prestigious award comes with nearly $1.5 million in winnings. The physicist, who teaches at Dartmouth and has written for NPR, says he's driven by the "many questions we still have no clue about." Marcelo Gleiser, 60, won the 2019 Templeton Prize for his work seeking the common ground between science and spirituality. Now, on his 60th birthday, he can add a new title to that long list of labels that so valiantly attempt to describe him: Templeton Prize winner. The John Templeton Foundation announced Tuesday that Gleiser has won its prestigious award, given out annually to an individual "who has made an exceptional contribution to affirming life's spiritual dimension, whether through insight, discovery, or practical works." Since its establishment in 1972, the prize has recognized Nobel Peace Prize laureates, spiritual leaders, dissident intellectuals and most recently, the Jordanian king. In the Brazilian-born Gleiser, the foundation says it has found a worthy new torchbearer, one whose work "displays an undeniable joy of exploration." "He maintains the same sense of awe and wonderment that he first experienced as a child on the Copacabana beach, gazing at the horizon or the starry night sky, curious about what lies beyond," foundation President Heather Templeton Dill said in a statement Tuesday. "As he writes in The Island of Knowledge, 'Awe is the bridge between our past and present, taking us forward into the future as we keep on searching.' "
In his five books in English and several more in Portuguese, the longtime Dartmouth College professor has balanced his scientific project — steeped as it is in information theory and the complex origins of life as we know it — with a desire to introduce nonscientists to the fruits of his research, too. Gleiser also launched the Institute for Cross-Disciplinary Engagement at Dartmouth, with funding from the John Templeton Foundation, which seeks to bridge science and the humanities. "You have to understand science in a more cultural and less technical context in order to really, truly get its value," Gleiser tells NPR. He says it was partly this mission that drove him, along with astrophysicist Adam Frank, to co-found NPR's 13.7: Cosmos and Culture blog in 2009. Before the blog's retirement last year, Gleiser estimates that he wrote more than 400 posts — which, despite their varied subject matter, often had a single idea undergirding them. Is That Another Wave Of Collapse Headed Our Way? "There are all sorts of scientific questions which involve values and moral judgments," he explains. "We tried to bring these things together into the conversation, so that you actually can make an informed decision about who you think your leaders should be, and what are the choices in your own private life that you should be making in order to make the world a better place." He and Frank have continued that mission for Orbiter Magazine, writing for a blog now titled 13.8 — a name change that, in its own right, suggests the sometimes confounding nature of scientific study. The age of the universe is no longer widely believed to be 13.7 billion years old, as it was when they began their blog on NPR; now, many researchers say the number is actually closer to 13.8 billion. But Gleiser isn't frustrated by this kind of elusiveness, so often evident in the subjects he studies. Quite the opposite, in fact. "There is all this stuff that science has discovered, but there are so many questions we still have no clue about. Because nature is so much smarter than we are, we're always playing this game of catch-up," he says. "So I look at science as this kind of flirt with the unknown, and what motivates this spirit of discovery is awe and the joy of being part of this process." It was this heady mixture of awe and joy that attracted the Templeton Prize judges to Gleiser's work. In explaining why he won the award, the foundation cited his attempts to thread the disparate disciplines of science and the humanities, and the rigor of experimental research with an embrace of spirituality. For his efforts, the foundation has awarded Gleiser 1.1 million pounds sterling — slightly less than $1.5 million. And it has set his name in a collection of Templeton honorees that includes Mother Teresa, Desmond Tutu and the Dalai Lama. But Gleiser downplays what he calls the "small progresses" he has nudged along. Instead, he says there's enough joy to be found simply in chipping away at the great unknown. "Einstein had a quote, you know — he used to say what drives science and the arts is our relation with the mysterious," he says. "In a sense, in a very humble way, I'm trying to magnify this message to reach many more people — to say that we are not just building machines and fast cars and GPS. We are actually confronting the mystery of who we are."